Latest bank report notes the difficulties facing the government in reaching targets. 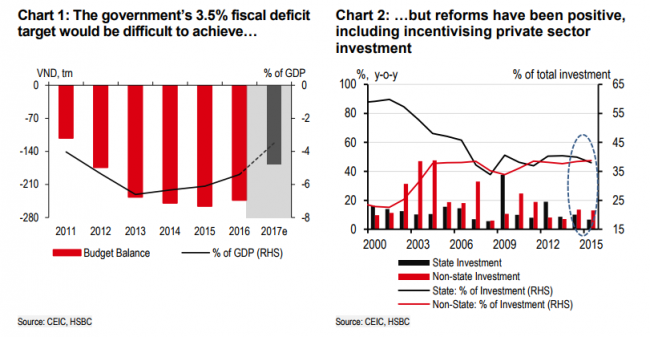 While a renewed focus on equitizing State-owned enterprises (SOEs) has been exhibited following the leadership transition in April last year, equitization alone is not a short-term solution to reducing the government’s fiscal deficit. Rather, meeting the government’s 3.5 per cent deficit target for 2017 would have to come on the back of reduced government expenditure, which HSBC in its latest report believes is unlikely, given the government’s growth targets. It has been consistently framed in recent statements by policy makers that the sale of SOEs is viewed as a means to both increase fiscal revenues and reduce government expenditures. One of the highlights, Decision No.58, signed by Prime Minister Nguyen Xuan Phuc on December 28, 2016, pushed for further divestment of State capital in existing SOEs by eliminating or reducing the minimum level of ownership that the government holds in certain industries. What makes Decision 58 a positive move and deserving of full recognition is the fact that it provides a clearer roadmap for equitization by announcing a total rate of State ownership in specific companies (not just broadly by sectors) that are set to be equitized. As the new sense of urgency in SOE equitization is mainly driven by rising public debt, increased equitization leading to greater revenues and alleviating the government’s fiscal burden is no easy task given the remaining challenges in SOE reform and the recent trends in government expenditure. SOE reform has primarily focused on targeting the sale of minority stakes, while the government retains majority control. This has left strategic investors with limited ability to reshape Vietnamese companies, improve corporate governance, and make the companies globally competitive, deterring private investors from fully participating in the process. HSBC believes additional reform measures remain crucial to fully realizing the government’s equitization agenda. SOEs and localities themselves have been slow to participate in the equitization process, with Deputy Prime Minister Vuong Dinh Hue telling a government meeting last month that the lack of effort was due to fears that violations may be exposed. As a result, only six out of the 45 SOEs slated to be equitized this year are ready to complete the task, bringing down the number of SOEs expected to complete equitization this year to 40. Slow equitization has also meant that Vietnam’s earnings from SOE divestments have been lower than expected, with equitization and divestments netting nearly $3.4 billion for the State budget from 2011-2015; quite low for a five-year period. Things seem to be turning around slightly, however. By the end of the second quarter, Vietnam earned VND11.6 trillion ($504 million) from divestments, an increase of 314 per cent year-on-year. Meeting the 3.5 per cent fiscal deficit target will rely on drastically reducing government expenditure. The budget deficit has grown consistently over recent years, and, under HSBC’s estimates, would have to decline to around VND168 trillion ($7 billion) to meet the target. This figure is even lower than the deficit in 2012 in nominal terms, and also relies on the assumption that the country meets its growth target of 6.7 per cent for 2017, which HSBC believes will come in at just 6 per cent. In a positive sign, the government continues to gain momentum in other reforms, such as encouraging the private sector to play a greater role in the economy. For example, non-State investments over the past few years have caught up to State investments in terms of the percentage of total investment in the country. Moreover, the public sector has been particularly active at investing in key infrastructure around the country, which should lay the groundwork for even greater private investments in the future. “For now, it may be too early to expect SOE divestments to provide the government with a significant boost to revenues, but continued reforms could provide it with the gains it seeks over the medium term,” HSBC’s economist Mr. Noelan Arbis noted.